When we first heard about Haiti’s massive earthquake we worried about the local organizations and entrepreneurs we’ve been talking to. Over the last six months Inveneo had been exploring expansion into Haiti, building relationships with nonprofits and the technical community to expand our innovative technology model into the country. But our worry soon became action. Inveneo is not usually set up for emergency response, but we do have deep experience in deploying ICT in difficult resource-constrained environments and we know that reliable communications are a huge need in post-disaster relief efforts. We also had developed strong relationships with organizations working in Haiti, like NetHope and the EKTA Foundation and the Clinton Global Initiative. So we were able to develop a targeted, actionable objective with NetHope – to restore communications to many of their members who operate in Haiti. Together, we have devised a plan to deploy long-distance wireless network connectivity from VSAT links being put in place by NetHope to their in country member NGOs. This network will support Internet access in and out of the country, carry voice communications until the cellular networks are repaired and allow for collaboration and sharing of resources among NGOs. Establishment of networks like this is a cornerstone of our core competency and provides an avenue for us to deploy additional ICT infrastructure and participate in longer-term capacity building and reconstruction opportunities in country. Mark and Andris are currently en route to Haiti and we’d like to give a big thanks to both United Airlines and Airline Ambassadors for making this happen – at one point, both staff and their 3/4 ton of gear were booked on four different flights just to make sure they get to Haiti. Planning for Inveneo’s Haiti earthquake response is very exciting, but it’s just that, planning. In many ways we are just at the beginning of the journey: Tomorrow we face the real challenge and start the real work – implementing a communications network under emergency conditions in a disaster zone. And the need is great. We’ve already received requests for assistance from other organizations in Haiti. As we gain a better understanding of local conditions and local partner resources, we hope to expand our impact and establish lasting ICT capacity in Haiti. We still have the long-term goal to expand our innovative technology model into the country. In these efforts, we’d love for you to stay involved. We’ve already launched a central point for communications, and you can follow us in real-time via RSS, Twitter, Facebook, or Youtube. NetHope has agreed to provide funds to cover the cost of equipment and the EKTA Foundation has generously supported the initial deployment. We are making an appeal for donations to cover the quickly escalating costs associated with our Haiti relief efforts. Please donate to Inveneo using PayPal or Google Checkout below. 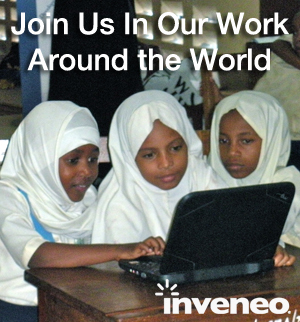 Inveneo is a US-based 501(c)3 non-profit charitable organization. If you are a US resident, your donation may be tax deductible. All donations through January 31, 2010 will be used only for Haiti relief efforts, including the project to get connectivity to the major NGOs in Haiti. Haiti Update: Inveneo’s earthquake response has begun! Over the last six months Inveneo had been exploring expansion into Haiti, building relationships with nonprofits and the technical community to expand our innovative technology model into the country. In the face of this catastrophic earthquake, Inveneo feels an even stronger sense of commitment to improving the lives of the Haitian people. We wanted to offer our services and expertise to help however we can. Much of the telecom infrastructure in and around Port-au-Prince has been severely damaged or destroyed by the earthquake. There is a great need for expertise in ICT to support the relief efforts – dependable communications infrastructure is vital in emergency relief operations to help coordination of recovery efforts. We have been asked by NetHope, a collaboration of 28 of the world’s leading humanitarian organizations, to work with them on restoring communications to many of their members who operate in Haiti. Together, we have devised a plan to deploy long-distance wireless network connectivity from VSAT links being put in place by NetHope to several of their member NGOs operating around Port-au-Prince. This network will support Internet access in and out of the country, carry voice communications until the cellular networks are repaired, and allow for collaboration and sharing of resources among NGOs. Establishment of networks like this is a cornerstone of our core competency and provides an avenue for us to deploy additional ICT infrastructure and participate in longer-term capacity building and reconstruction opportunities in country. 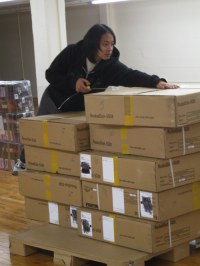 NetHope has agreed to provide funds to cover the cost of the equipment that will be needed to establish these links. With the generous support of our partners in Haiti, the EKTA Foundation, Inveneo will initially send two of our staff engineers to conduct the wireless network deployment starting the week of January 16th. We are making an appeal for donations to cover other costs associated with our Haiti relief efforts.